I almost dismissed the dream. Another release dream, I had thought as I woke with the lingering emotions of irritation and frustration. Then I thought about the flying squirrel and why it took the leading role in my dream. I was in a large, multi-storied house, my house (but not my house in this life), and it was undergoing renovations. The renovations where absorbing a lot of time, finances and physical and emotional energy, as they often do. My recollection of the dream begins on the main, lower floor, where I watched a flying squirrel fly and land throughout a white room. My family was with me and we were all trying to capture it, but it managed to evade our attempts. It is worth noting, at this point, that I have experienced the mixed emotions of having a flying squirrel inside of my present-day home. Not once, but twice. On both occasions, the flying squirrel had made its way to the basement level of my home, where it quite successfully evaded capture by my two cats. 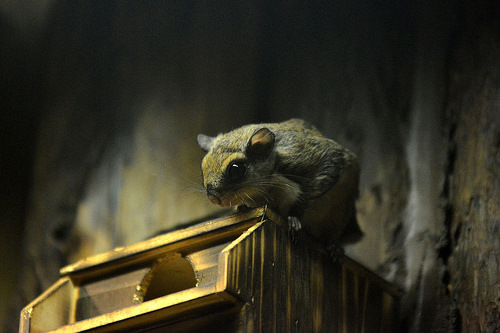 Flying squirrels, if you have had the pleasure of meeting one, especially in your home, are rather cute little critters in an unnerving sort-of way. They have huge black eyes that stare unblinkingly into the very depths of your soul as you try to maintain the stance of brave warrior. When you look away, and you will, they fly, soaring to their next perch in that blink of the eye, which causes your heart to stop and your body to arrest into panic. It doesn’t matter that you’re dealing with 2 pounds of furry cuteness. This foe is silent, unpredictable and quick. And, did I mention those eyes?! Well, you’ve got the picture by now. Back to the dream. I’m not sure if we managed to catch the intruder, and it doesn’t really matter. When we walked to the top, attic floor, which was quite large and expansive, with high, peaked ceilings, what we discovered was much worse that what was happening below. There were nests everywhere, hanging from the ceiling and I knew we were doomed. The task of recovering the house from the squirrel invasion seemed overwhelmingly futile. I was about ready to throw in the towel when I woke up. Naturally, those emotions lingered as I was pulled into the waking dawn. Then, as the day progressed, I began to think about those flying squirrels and why they had made their way into my dream and, well, into my body (as the house metaphor). And that’s when it hit me. They were thoughts. Thoughts that begin in the attic, or the mind, and find their way of invading the lower floors of our bodies, evading capture as they find a place to hide. I couldn’t think of a more perfect metaphor if I tried to. The flying squirrel is a nocturnal animal. The owl is its primary predator. As you ponder this, consider how they invade our houses (and bodies), often coming in through trees (as they had in my dream) and making their way down from the attic into the lower levels in their attempt to hide, and ultimately to escape capture (even though what they really want is a safe, warm place to call their own, while also trying to get back to their natural home). The thought also follows this pattern. First it invades the space of our mind, often nesting and breeding into more thoughts that are related to the first one. Eventually, those thoughts, when we choose to keep them and breed them, make their way down to the physical body, finding dark, warm places to hide and live. But, like the flying squirrel, they don’t really belong in our body-as-home, they are meant to fly free, outside of the mind. The are meant to come and go, but never take up permanent residence. When they do, thoughts turn into emotions that stagnate and cause discomfort. When these thoughts- turned-emotions arise from those dark places of fear, which they often do when they linger and take up residence, they become permanent attachments of energy that create dis-ease and disease. My dream was a warning. My mind’s way of saying get rid of these fears before they breed and travel. It seems at least one had already escaped. Although it’s not a pleasant “thought” to linger on, I’m okay with it. I’m going to let it go. I’m going to trust that in each moment we are offered the choice. We can hold on, or we can let go. This entry was posted in Animal Messengers, Dreams and tagged body as a house for emotions, emotions as disease, flying squirrel messenger, flying squirrel symoblism, flying squirrel totem, the power of thoughts. Bookmark the permalink. That is great! I am not sure if these are really for you personally, but more for you to write and share your GREAT analogy! Thanks Awesome advice! The sort of unfathomable dream drama that’s telling us something in very direct language.